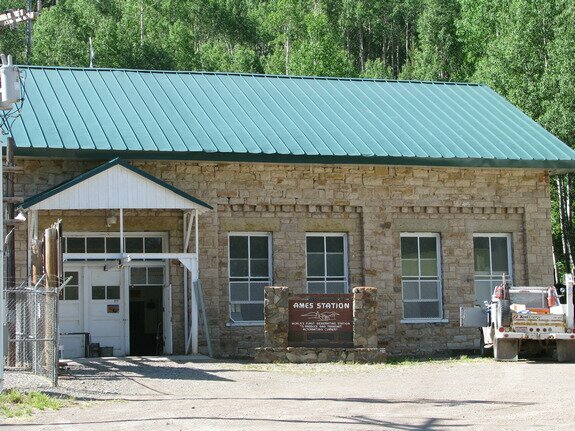 Ames was the first alternating current commercial power plant in the United States, built by Lucien Nunn in 1891. As the Manager of the Gold King Mill above Ophir, he was looking for a way to keep costs low. It was, at the time, costing $2500 per month to haul coal to the mill. Nunn built the power plant and strung wires the two and a half miles to the mill. It cost around $500 a month to run. There is a plaque on the highway above in dedication to Nikola Tesla, who favored his AC system over Thomas Edison's DC system. 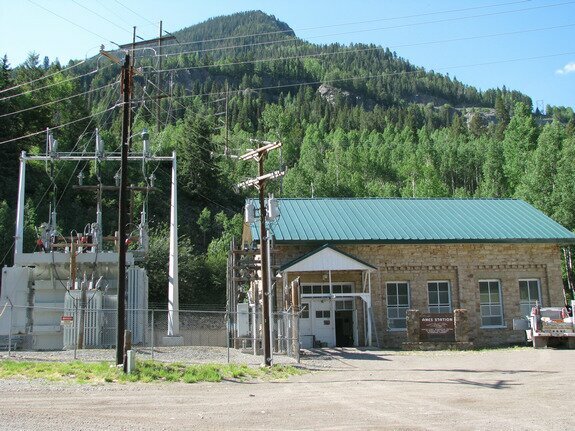 As a side note explained in the Telluride Historical Museum (Thanks Sonchia), originally the generator and motor at each end had to be spun up to speed using a DC motor. When both motors were at full speed and synced up, power transfer could begin. Date Taken: 2008:06:24 09:46:48 Want to use this image? See the More information tab. Date Taken: 2008:06:24 09:46:56 Want to use this image? See the More information tab.